Submission details are non-editable details which belong to the submission. Submission details are located in the top right side of the Submission correction page (see Figure). "Created by" on the Submission correction page refers to the user who actually started the autoregistration procedure, which failed, resulting in a submission in the Staging area. He is not necessarily the user who will actually register the submission from the Staging area. It is possible that a structure prepared by "chemist1" was sent to the Registry by "user2". If the submission is not autoregistered, it will fall to the Staging area. 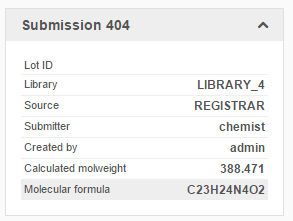 In this case, on the Submission correction page the Submitter is: "chemist1" and the Created by is: "user2". In the Staging area the submission is picked up by "reg3", who will be register it successfully. On the Details and Search pages, the Created by fields will be populated with "reg3".